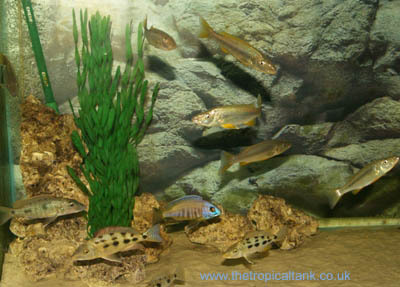 This tank housed predatory open-water Malawi cichlids. Decor Ocean Rock and artificial Vallis. 30% water change every week. Fish stock Pair of Copadochromis sp cf "thinos"
Pair of Protomelas "spilonotus Tanzania"
Protomelas "spilonotus Tanzania" Rhamphochromis sp "chilingali"
This tank housed some of the more predatory open water Malawi cichlids (and one rarely encountered species from nearby Lake Chilingali), and therefore has plenty of open swimming space. Minimal decor has been used at the back and corners of the tank, consisting of 'Ocean Rock'/'Holey Limestone' (pieces with no sharp edges have been used), and some artificial Vallis plants.